In 1998 we discovered an old breezeblock shed next to Adrigole pier and slipway. We thought the location of a building by the edge of a sheltered harbour, surrounded in hills and mountains was perfect for a sailing school. So, West Cork Sailing Centre was set up and our first 8 dinghies bought. We operated for two years from the old shed, with no running water. Customers enjoyed the atmosphere, quality of equipment and expert tuition, and recommended us to their friends and family to provide us with more bookings. In 2000 we got planning permission for our new centre and construction started in December of 2000. Paddy Bat and his team of builders worked hard to complete the building for June of 2001. The luxury of hot showers, toilets and underfloor heating was wonderful. The new building has lecture room, offices and cafe area, so The Boat House Cafe was opened for passing customers to enjoy a cappuchino while watching the boats sail by. In 2002 we received our Wine Licence. 2004 was a very busy summer and one of our children was very ill, so we closed the cafe to passing trade at the end of the summer and the comfortable dining area is now for our sailors only. We provide a buffet lunch with lovely home made soup to our sailors every day. In 2004, the fleet increased to 40 boats and a team of ten instructors working in the summer. The cafe is now known as the Bistro and is now only open to our customers or parties. This gives our customers their own relaxing lounge room to catch up on the days events at lunch time and at the end of the day. 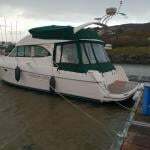 The local area has taken a great interest in the development of sailing and to try and increase the availability of boats to the area we have linked up with Bere Island Sailing Club with three 20ft Sun 2000's from Jeaneau, which are in our fleet. We also take care of Beara Community Schools fleet of six Toppers. 2005 and our dream boat joins the fleet – A Jeanneau Sun Odyssey 37 Legende. 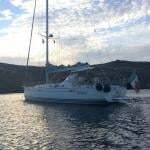 She is just perfect for comfortable sail training. So, we now offer the ISA Cruising Scheme training courses – Yachtmaster, Day Skipper and Competent Crew. The centre also became RYA approved to provide dinghy, keelboat, powerboat and cruising RYA certificates to our UK customers. In September 2006 the Commercial Yachtmaster Intensive training course was launched and the centre is now busy throughout each winter training complete beginners to become Yachtmasters on a six-month course. It is now 2008 and we have a total fleet of 50 boats, kayaks, dinghies, keelboats, powerboats and yacht. The future is bright, as we plan to build the West Cork Adventure Centre with high ropes, low ropes, indoor climbing, archery, underground mazes, orienteering, climbing and much more. All inconjunction with the development of accommodation designed specifically for the outdoor enthusiast. So watch this space as this new dream develops. We are open to new projects and ways of developing sailing within the area, so if you have any ideas please get in touch. We hope to see you on the water with us soon. HOT SHOWERS - peel your wet suit off in a hot shower!